Price Includes Design, Manufacture, Installation & Tax. 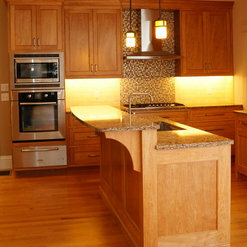 Our Hand-crafted Kitchen Cabinets are built Meticulously for your project right in Leominster MA. We do our own installations as well. We are a Small, Personalized, Owner-Operated business. Right from the start, just chatting with Angie over the phone about my townhouse kitchen project, I had a good feeling about the Taylors. Then after meeting them in person in their shop - they spent two hours with me on a Saturday giving me a tour and explaining their process and philosophy - I knew I was making the right decision. Also, they were just as excited about my project as I was, something that I hadn’t seen from other places I had quoted with. I had several custom features that I wanted incorporated into the design and Angie worked them in beautifully. I replaced my existing layout plus added a new full-wall pantry/microwave cabinet structure that is just stunning. The design process was actually fun! Angie and Bob are so easy to work with and are very knowledgeable and professional. The installation took only 2 and a half days. Bob has a masterful crew that took great care in making everything just perfect. I really appreciated their attention to detail. The quality of the work is outstanding, and they met my budget and timelines. But maybe the best part is, they stand by their work even beyond the installation. I highly recommend them. Thank you very much Heidi, we appreciate your business and it was fun to build and design it with you as well! We are glad you love your new kitchen! 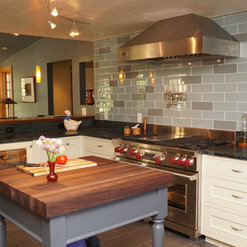 We hired the Taylors to build a contemporary custom Kitchen as part of a renovation of our 1965 Deck House. The result was nothing short of amazing! We are very happy with the workmanship and attention to detail that went into the design, production, and installation of our cabinets. We had very specific requirements for our project because we wanted to keep our kitchen in the original Deck House style while updating the entire room with modern cabinetry. The Taylors really listened to us and our ideas and preferences for the design. Totally worth going the custom cabinet route intead of buying cookie-cutter retail cabinets, we love the result!! Thank you very much for the review Ned. It's hard to believe this wood is Natural and has no stain on it. It looks really lovely & modern. Thank you for sharing these pictures. The heat vents behind the back splash are nicely disguised as well! Best Wishes to you and Gloria. 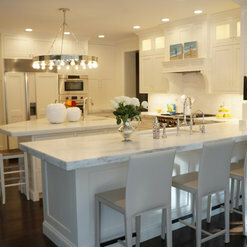 When deciding to build a custom home, we knew immediately that the kitchen would be the single most important space. Taylor Made Cabinets was recommended to us by another homeowner in our development and we could not be happier with the results! From our initial conversation to the design process and final installation, everything is exactly as we envisioned. Angie is extremely detail oriented and took into consideration all of our thoughts and ideas. Bob is an experienced craftsman whose work is truly remarkable. They are professional, responsive and an absolute pleasure to work with. 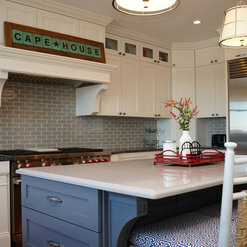 I highly recommend Taylor Made Cabinets and look forward to working with them again in the future. 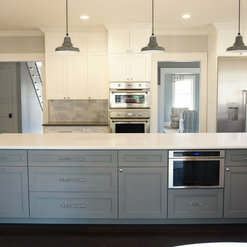 My husband and I did a kitchen make over and decided to hire Taylor Made Cabinets for this job. We could not be any happier with this decision. Not only did Bob and Angie take the time to really listen to our ideas on what our dream kitchen would be, they went over and beyond to make sure this dream came true (and may I add without pressuring us to do more/spend more than we wished, a big plus for me). 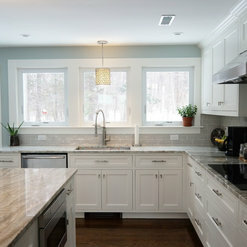 From the excellent cabinets and unique island design, to the professionism of the installers, Taylor Made Cabinet's teamwork made our renovation look smooth and easy. The staff was very knowledgeable, extremely efficient and amazing to work with. 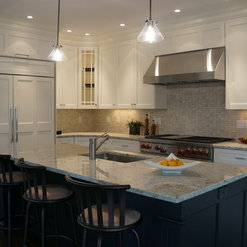 We are completley satisfied and 100 percent recommend Taylor Made Cabinets for your dream kitchen. Thank you Lori, I'm glad you are happy with it. You were a pleasure to work with as well. Best wishes! We were in the market for a media center to house my stereo and cable equipment below a large flatscreen TV in the family room. We shopped the chain and specialty furniture stores and didn't find anything that had the quality of wood, workmanship or interesting style that we wanted. We looked into custom cabinetry and after reviewing several companies went with TaylorMade because of the quality of their customer samples. Bob and Angie worked with us to design the piece, providing 3-D renderings to confirm the "look and feel". No aspect was too small to be considered, from the interior clearances to the exterior details such as fluting, raised panel thickness, router styles or ventilation slots. We came up with a stained cherry design with center speaker shelf, protruding media area with smoked glass doors, and self-closing storage doors and drawers. 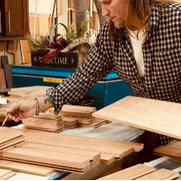 Bob Taylor is a true craftsman, and his team make exceptional pieces. The workmanship is outstanding, truly flawless construction and finish. 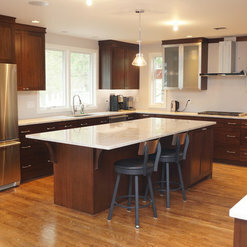 We couldn't be more pleased with Bob and company's work and recommend them highly to anyone looking for fine quality cabinetry. Thank you very much Jim! We are so glad you are happy with it. After a lot of searching and interviewing cabinet makers in the Boston area and western Massachusetts, we met Angie and Bob. They accommodated us to visit them at their shop on their day off because that was the only time we were able to take time off from work ourselves. Angie even had toys and coloring books for our children to keep them busy while we talked to them about our project. 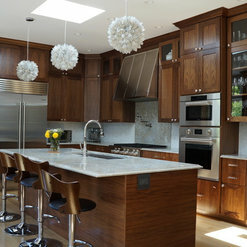 The project was a large black walnut kitchen with a center island, large pantry, media cabinet with floating shelves, 2 bath vanities, and a linen cabinet. The workmanship was impeccable, Bob is truly masterful in what he does and takes great care to customize the product to our needs. Angie was very helpful in putting the designs together and suggesting many ideas and solutions for us. They were competitively priced and we feel we got great value for this huge order. They delivered the pieces on time and stood by their product when we needed a few adjustments made. Bob and Angie were a dream come true! They were so kind and helpful throughout each step of the design, building, and installation process of our kitchen cabinets. It was important to us to find the most healthy and beautiful cabinets and Taylor Made was perfect fit for our family and home. Bob's work is incredible - so meticulous and timeless. And Angie was beyond helpful answering emails all hours of the day and taking phone calls early in the morning. We can't wait to work with them again! From the moment we sat down with Bob and Angie we just felt this was going to be a great experience. Most importantly we were interested in supporting a local business / local craftsman, and as a result we received a level of personalized attention that was unmatched by other large retailers, Both Bob and Angie worked with us very closely throughout the process of our vision; honing in on the final product numerous times, countless meetings and phone calls until final images were approved. Once the kitchen was completed we were amazed to see the final product come together. We received a magazine quality Kitchen for a great price. Thank you Rick, it was a pleasure working with you. Working with a general contractor for a major house renovation on an unusually tight timeline, we hired Taylor Made Cabinets to build and install a custom contemporary kitchen (including a wall of base cabinetry with lots of bells and whistles, a 13 foot island with a stunning walnut top, a built-in hutch with frosted glass doors, and a beautiful walnut floating cabinet/buffet for the dining room). In all aspects of the job, Angie and Bob were extremely professional and a pleasure to work with. The quality of the work is astounding, and they delivered it on time and on budget. I highly recommend them for your project. I hired Taylor Made to design and build Custom Kitchen cabinets, two bathroom vanities, a custom office, and theatre room bar. They did an amazing job.! 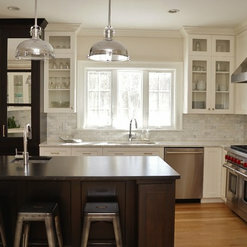 The cabinets are beautiful and of high quality. Taylor Made stands behind their work! When there were adjustments to be made, they came out right away and took care of it. They completed the work on time and they are wonderful to work with. I would highly recommend them to anyone wanting beautiful, custom, quality cabinets! The Taylors are highly recommended. They were very professional and provided high quality cabinets. My project had a few odd items, a hidden door that would look like decorative panel and stand alone butcher block - basically a piece of furniture. They knew just what I was asking for and did a great job providing these special items. I have worked with other cabinetmakers in the past that wouldn't even think of doing anything out of the ordinary. I have recommended them to all my neighbors. Bob and Angie are amzing people and it really show in their business relationships and in the beautiful work that Bob does with wook. They made me a custom Bathroom vaniety and it was PERFECT and really finishes the room. I plan on having them make some Kitchen cabinet doors after the holiday. They are #1. Commented: backsplashThank you. I'm afraid I don't have the tile info. Commented: Pegboard for drawetWe purchase our Peg Drawer inserts from Rev-A-Shelf.com but if you do a search you'll find assorted prices and venders. 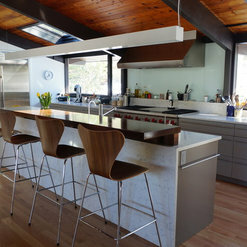 Commented: Love the counter stools. Can you possibly tell me where to purchase?I would check Wayfair but not I'm not positive. Commented: MirrorsThe mirrors were purchased by the Interior Decorator but if you Google &quot;weathered mirror frames&quot; you will find many similar to it there or on Etsy.